An increase in large N-glycans attached to cell surface proteins upon malignant transformation of cells was discovered independently by Warren’s group and Robbins’s group in early 1970’s. The structural basis of this phenomenon was shown to be an increase of highly branched N-glycans in cancer cells by Kobata’s group and Pierce’s group in 1980’s. However, biological significance of the highly branched N-glycans is still unknown although tumor-associated antigens are often expressed on these N-glycans. Dr. Furukawa and his colleagues considered that the galactose residues on N-glycans are important not only for the basis of such antigens to be expressed but also for recognition by a variety of galectins, and tried to elucidate the biosynthetic pathways by isolating the genes that encode for β4-galactosyltransferases (β4GalTs). 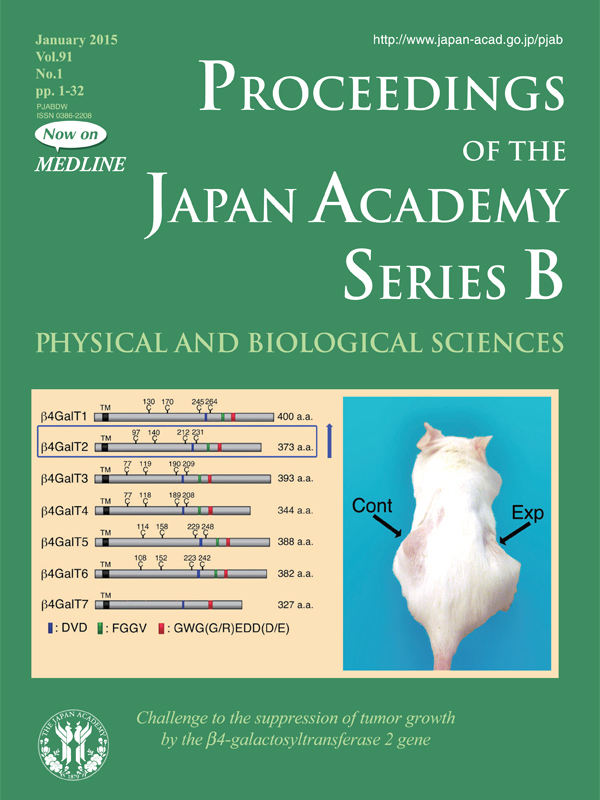 Their studies and others now show the occurrence of seven members which constitute a β4GalT family shown in a left panel on the cover, and their acceptor-specificities described in the review (pp. 1-16). Then, Dr. Furukawa’s group found the expression level of the β4GalT2 gene decreases while that of the β4GalT5 gene increases in a variety of cancer cells. Since β4GalT2 is involved in the galactosylation of N-glycans, they isolated mouse melanoma cells with enhanced expression of the β4GalT2 gene by the gene transfection, and found marked growth retardation of them in vivo. For a practical application of this gene, they injected human β4GalT2 cDNA into human hepatocarcinoma grown in SCID mice, and observed significant growth inhibition of the tumor (indicated with an arrow Exp in a right panel of the cover). The transferred gene was converted to the active enzyme to further galactosylate N-glycans of several membrane proteins. This probably induces apoptosis of the cells and inhibits angiogenesis of the tumors, which leads to growth inhibition of the tumors as described in detail in the review. The enhancement of the β4GalT2 gene expression in tumors is one of the promising ways to suppress human tumor growth. 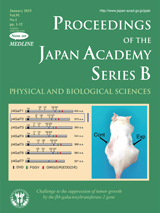 The cover figure was modified from Fig. 2 and Fig. 10 of the review article in this issue.